The garden meeting this morning in the garden was well attended, and we discussed some exciting upcoming plans. If you would like to attend, the meeting is usually at 10am on the first Saturday of the month, with a few exceptions. When the weather permits, we meet in the garden, otherwise, we meet in the city hall building. Subscribe to this blog, and you will receive email updates of blog postings, which include garden meeting updates. Or check the garden kiosk for printed notices. 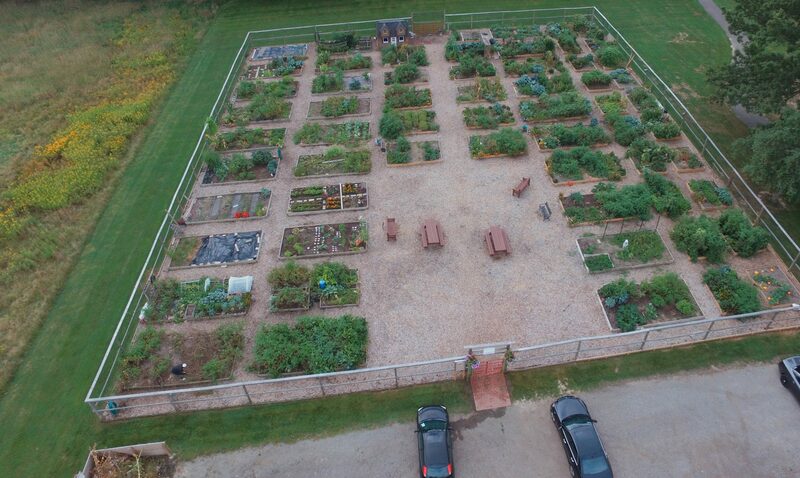 The gardeners at today’s meeting expressed gratitude to Gary Myers for his fantastic arial photographs of the garden that are posted in the blog post below. Volunteers needed: If you would still like to volunteer with other gardeners at the Salute to Orange this Sunday, September 4th anytime between 5:30pm and dark, please email orangevillagecommunitygarden@gmail.com. Garden Photos wanted: If you have photographs of the garden that you would like to have posted on our Orange Village Community Garden poster to be display at the Salute to Orange, please email us. Produce wanted: We plan to give away baskets of produce from the garden during the festivities. If you have any extra produce to donate, please email us as well. October Garden Meeting and Fall Cleanup: Saturday, October 8th 10am (rain date Sunday, October 9th, 10am). We will hold our next garden meeting a week later, on October 8th. It will be a working meeting, where gardeners are encouraged to clean up weeds or plants in their gardens that are finished producing. Gardeners are welcome to continue growing other plants, but we would like to start the fall cleanup process to keep the garden looking beautiful. Gatherings in the Garden: Every 2nd and 4th Friday of the month through October. 7pm. Please feel free to bring your own drinks and snacks to our gatherings in the gardens, if you would like to. Or bring something to share if you feel inclined, but that is completely optional. At past meetings, some gardeners brought snacks made from their garden harvest for others to sample. Judy brought steamed edamame and tasty dried cherry tomatoes. Or just join us to socialize in our beautiful garden. If you or anyone you know are experiencing a hardship and need help keeping up your garden, please email orangevillagecommunitygarden@gmail.com, and we will find volunteers to help. Also, if you have produce that you cannot harvest for any reason but wish to donate, please contact us, and we can find volunteers to harvest the produce. The people who are doing the harvesting will then donate the produce to a charity of their choice. We would like to begin a program to donate excess produce to charities that have a need for fresh vegetables. We plan to start a program next Spring, but we are happy to start this year if there is a need. Please contact us if you have excess produce or if you would like to be involved with this effort. Eddy, our own Master Gardener, reminds us that the Ohio State Extension Office, that we have access to because of Eddy’s Master Gardner status, is a valuable resource for gardening questions, advice, classes, a hotline, and field trips. Please check back on the blog soon for more updates about the Ohio State Extension Department. Please remember to weed gardens regularly to prevent weeds from going to seed and spreading unwanted weed seeds to paths and neighboring gardens. Also, please remember to not leave pulled plants or weeds in the paths. Thank you to everyone who has been doing a wonderful job keeping up their gardens. The garden has looked much better this year. If you would like to contribute to the blog, please email orangevillagecommunitygarden@gmail.com. If you would like to be a regular contributor, we could also give you access to post on the blog yourself, if you would like to. Please subscribe to the blog to receive email updates or stop by the blog for upcoming content, such as photos of the garden, upcoming garden events postings, videos related to gardening, Ohio State Extension information, recipes provided by other gardeners, etc.